Creeping heliotrope was unknown to me until a local plantswoman recommended the perennial. I brought six little pots home to my garden. Not knowing anything about the best placement, I planted the ground cover around a sundial and along a few rose bushes. After the first year, I realized that I had a prize edger so I decided to make better use the plants. During the relocation project I discovered that the heliotrope grows long taproots. Even if you move it, you probably have left it behind! Fortunately, I don't consider this a problem unless you plant it under roses (I'm still trying to remove it from that spot). The heliotrope is definitely deer, rabbit and sun proof. 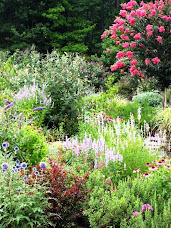 The plant thrives in harsh conditions for zones 7-11, though it would not surprise me if it grows in colder zones. 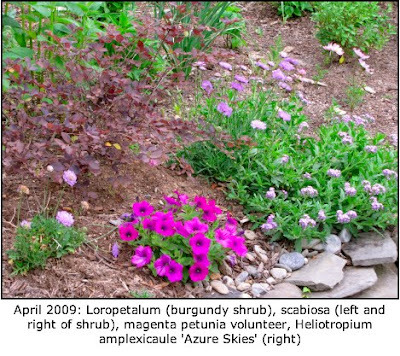 On my blog and on gardening forums, I sang the praises of this plant to everyone—for several years! No one had heard of it. No gardener could find it. 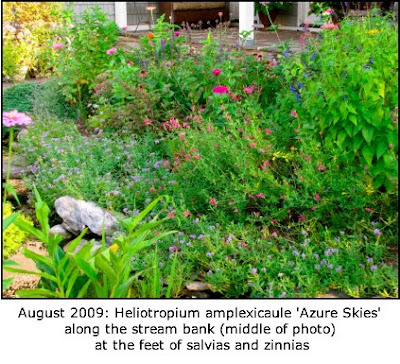 My friends thought creeping heliotrope was a make-believe perennial that only existed in my garden (or in my mind). 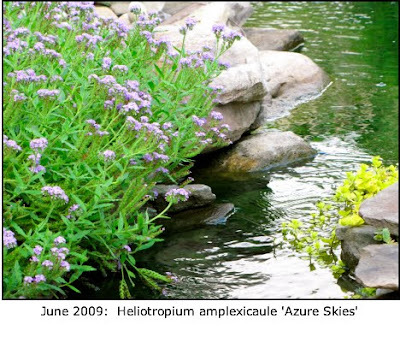 Although I made it famous, heliotropium amplexicaule 'Azure Skies' is now in the Southern Living® Collection, not the Freda Cameron Collection. 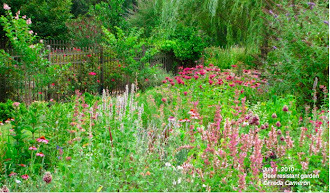 The perennial is from the Athens Select™ program. You can buy the heliotrope at retail garden centers in the summer, but I don't get any kick-backs or commissions for all my marketing and public relations efforts. Even the Grumpy Gardener had to visit my garden to take a photo of HIS perennial! I photographed six months of continuous bloom in 2009, but it actually bloomed into November before I finally cut it back. 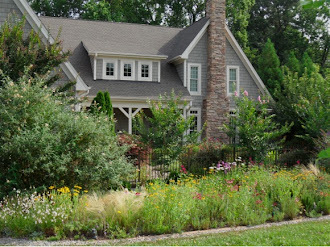 My favorite use is growing the heliotrope along the edge of the stream to cover the ankles of salvias, zinnias and other cottage garden favorites. 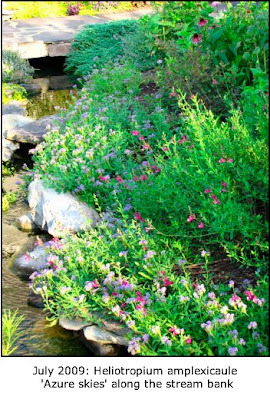 I planted the stream-side pieces, three feet apart, in spring 2009. 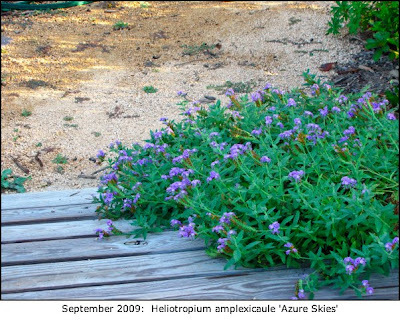 This heliotrope is not to be confused with the very fragrant, annual heliotrope. In fact, you could say this one doesn't smell too good which is probably why all critters leave it alone. My perennial heliotrope gets no care from me other than the fall cut back. It stands alone. It blooms. 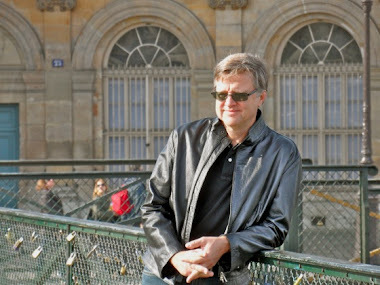 All spring. All summer. All fall. 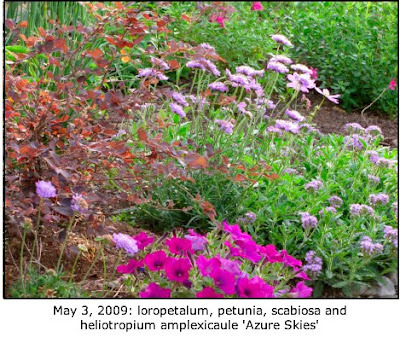 So, go ahead and add heliotropium amplexicaule 'Azure Skies' to your sunny garden, too! 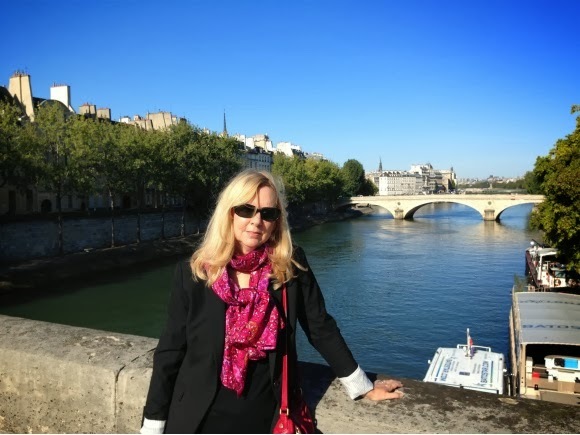 Words and photos by Freda Cameron, Defining Your Home, Garden and Travel. All company or product or patented names mentioned are registered trademarks/copyrights/patents owned by those respective companies or persons.